No active substance detected in this sample. Sugar and salt ruled out. Powder is not identified, and insoluble in solvent as well as water. 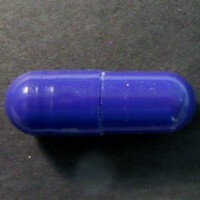 Purple capsule containing white powder. Sender notes they are 'hoping it doesn't have any meth or speeds'.